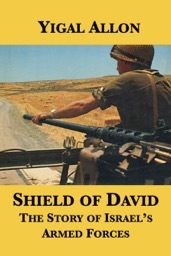 Shield of David tells the history of the Jews’ armed forces from the Palestine Yishuv’s first efforts at self-defense in the early 1900s, under the Ottoman Empire and the British Mandate, during Israel’s 1948 War of Independence, the 1956 Suez Campaign and until the 1967 Six-Day War. “In recent years, most particularly since the Six-Day War of June 1967, people throughout the world have asked themselves how it happened that the Israel Defence Forces won so resounding a victory over the Arab armies. What suddenly endowed the Jewish people — traditionally non-martial — with such impressive military skills? What is the secret of the prowess of Israeli soldiers, airmen and sailors?